With a member of our team to discuss your company or organization’s needs or are seeking a teaming partner or subcontractor for your proposal or project in the markets in which we operate, contact us by sending an email to info@oxuscorp.com. As a consultant, please submit your resume, including at least three references, to careers@oxuscorp.com. For consideration, you should possess at least five years work experience. 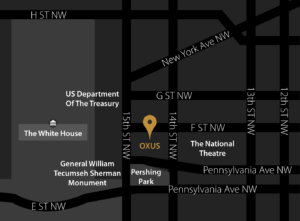 In your submission, please designate which areas of expertise that you have which fit OXUS’ service offerings. For any of the markets in which we offer business development services including Afghanistan, the EU, Japan, Turkey, UAE and China, please submit your company’s capabilities statement or profile, including at lease three business references, a list of the names and short bios of the owners and key executive officers of your company, and a copy of your company’s license, to vendors@oxuscorp.com. In order to be considered, your company’s registration should be active and in compliance with the laws of the country in which your company is seeking to offer services. We maintain the confidentiality of inquiries made and will not share your information with any marketing firms or third parties without your consent.